As the global LNG market tips into a state of oversupply, flexible LNG is flowing back into Europe and European hub prices are acting as a key global price support. Europe’s ability to soak up surplus flexible LNG will become an important driver of global pricing dynamics. In turn global LNG flows have rapidly taken centre stage as a future driver of the European gas market. In the three years following the Fukushima crisis, LNG supply played a relatively limited role in influencing European hub prices. Flexible LNG supply volumes flowed away from Europe to Asia, with Asian LNG spot prices providing the key global spot price signal. These dynamics have changed in quite dramatic fashion since the summer of 2014. 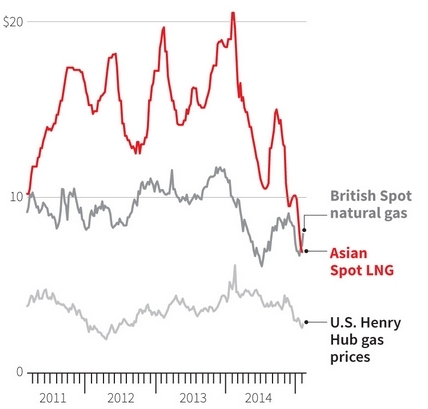 Asian spot LNG prices have declined rapidly to converge with European hub prices at around 7 $/mmbtu. As the global LNG market tips into a state of oversupply, surplus LNG cargoes are flowing back into Europe and European hub prices are acting as a key global price support. Q2 2014 marked the start of a new phase in global gas pricing. As a warning sign, Asian spot LNG prices halved across the first half of 2014, from 20 to just above 10 $/mmbtu as illustrated in Chart 1. This was exacerbated by a lack of underground gas storage and limited tank storage in Asian LNG importing countries. European hub prices slumped in sympathy. This was driven partly by surplus LNG flowing back into Europe, but also by the withdrawal of high European storage inventories given the loss of 57 bcma of demand (y-o-y) as a result of a mild winter. LNG spot prices made a brief recovery in Q3 in anticipation of winter. But as confirmation that a structural transition was taking place, spot prices continued their decline into the winter of 2014-15, with the crude price slump and a surplus of spot LNG cargoes adding to downward price pressure. Last week Asian spot prices slumped below European hub prices with buying interest in Asia having dried up. Price declines have not been limited to the spot market. Oil-indexed Asian contract prices are also set to fall towards 7 $/mmbtu this summer as the lagged impact of the crude price fall feeds through into contract price formulas. This means that the structural Asian price premium over European hubs has essentially disappeared. The global market looks to be entering a new phase of lower and more convergent regional gas prices. LNG market oversupply may be a temporary effect due to a mismatch between the timing of global demand growth and new supply. But it is also possible that the global gas market may be entering a more structural phase of oversupply lasting a number of years. The nature of this period of oversupply will have important implications for global LNG and European hub prices. Flexible LNG supply sources are then the key mechanism which clears the global market across the three regions. Flexible LNG supply consists primarily of divertible LNG contracts, uncontracted LNG production and US exports (from 2016). This often comes in the form of flexibility to move gas within the portfolios of larger energy companies which have broad LNG supply chain exposures (e.g. BG, Shell, Chevron, Exxon). During the post Fukushima phase of market tightness, flexible LNG supply volumes flowed away from Europe to Asia, driven by a significant Asian spot price premium. Now in an oversupplied global market, flexible LNG is flowing back into European hubs. Europe’s ability to soak up surplus flexible LNG volumes is set to be the key driver of pricing dynamics through the period of global oversupply. Chart 2 illustrates the projected European versus global LNG market balance in 2016. The left hand section of the diagram shows the supply and demand balance for the European gas market. The right hand side shows the global LNG market balance. In the current oversupplied world, European hubs need to absorb surplus LNG supply. In practice this means LNG flows displace flexible Russian gas volumes (e.g. swing contract volumes above take or pay). 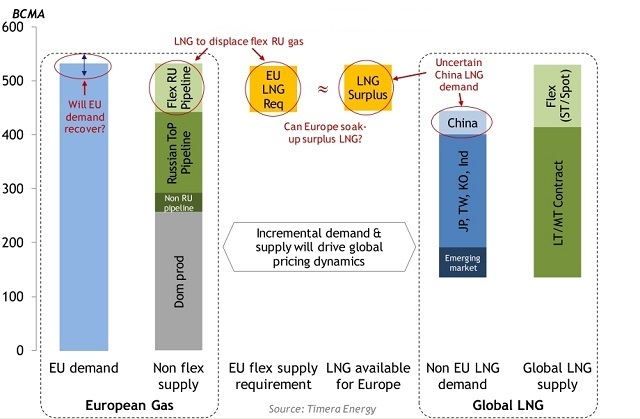 Europe’s ability to soak up surplus flexible LNG volumes will become an important driver of global pricing dynamics through the current period of global oversupply. In turn LNG flows are set to become a key driver of European hub pricing dynamics. The volume of LNG flow into Europe will influence absolute hub price levels. The profiling of flow patterns will also impact summer/winter hub price spreads and price volatility. Across the space of the last six months, the evolution of the global LNG market has rapidly taken centre stage as a future driver of the European gas market.